Objectives: To evaluate the usefulness of homoeopathic intervention in Schizophrenia, in untreated cases and antipsychotic treatment resistant cases, to verify indications of medicines, and to assess relapse, if any. Materials and Methods: A prospective, non-comparative, open-label observational study was carried out from October 2005-September 2010 by CCRH at Central Research Institute (H), Kottayam, Kerala, India. Patients between 20 and 60 years of age, presenting with symptoms of Schizophrenia were screened for inclusion and exclusion criteria. The patients who were on antipsychotic drugs were allowed to continue the same along with homoeopathic medicine, the dose of antipsychotics was monitored by the Psychiatrist. The symptoms of each patient were repertorized, and medicine was initially prescribed in 30C potency after consulting Materia Medica. Patients were followed up for 12 months. Outcome of treatment was assessed with Brief Psychiatric Rating Scales (BPRS). Analysis was done using Statistical Package for the Social Sciences SPSS Version 20.0. Results: Out of 188 enrolled patients, 17 cases did not complete the baseline information. Total 171 patients were analysed as per modified Intention to Treat Principle. Significant difference (P = 0.0001, P < 0.05) in the mean scores of BPRS, using paired t test was observed at end of the study. Sulphur, Lycopodium, Natrum muriaticum, Pulsatilla and Phosphorus were found to be the most useful medicines in treating schizophrenic patients. Conclusion: The study reflects the positive role of homoeopathic medicines in the management of patients suffering from schizophrenia as measured by BPRS. The schizophrenic disorders are characterized in general by fundamental and characteristic distortions of thinking and perception. The most important psychopathological phenomena include thought echo; thought insertion or withdrawal; thought broadcasting; delusions of control; hallucinatory voices; and thought disorders and negative symptoms. The World Health Organizations global burden of disease estimates of 2011,  indicate that schizophrenia is the 17 th leading cause of years lived with disability as compared to being 19 th in the year 2000. According to the WHO Mental Health Gap Action Programme in India, the prevalence rate is 200 cases per 100,000 people for schizophrenia. A report by the World Federation for Mental Health in 2008 signified that about 60-70% of patients relapse within 1-year without maintenance treatment,  which is a major issue of concern for the society as it affects the overall growth of a person and society and hence of a country. Timothy and David have recommended in their report that "though medication is a vital part of treatment for most people with schizophrenia but it can be complemented by many of the other options such as traditional and alternative treatment in most people with schizophrenia." Homoeopathy can be a useful treatment option in psychiatric cases as it treats patient holistically taking mind and body into account. Moreover, Homoeopathy is being known for having no side effect,  it can be a preference for the patients of schizophrenia. In an observational study conducted by CCRH from 1984 to 2005 , at CRI (H), Kottayam, Kerala, India, on 4179 patients with different types of behavioral disorders, it was found that 785 were schizophrenic. Accordingly, the current study was planned on a scientific protocol with definite outcome parameters, which are internationally accepted. The primary objectives of the study were (a) to evaluate the usefulness of Homoeopathic therapeutic intervention in "schizophrenia," (b) role of homoeopathic therapy in the untreated cases of schizophrenia. Secondary objectives were (a) to assess advantage of homoeopathic therapeutic intervention in antipsychotic treatment resistant cases, (b) verify the prominent indications of the remedies, and (c) to assess relapse, if any. The study was prospective, non-comparative, open-label observational in which the patients having symptoms of schizophrenia were screened from the outpatient department of CRI (H), Kottayam, Kerala, India, during October 2005-September 2010. The treating physicians or investigators were registered homoeopathic practitioners and had more than 10 years of clinical experience. The study protocol was in accordance with the Helsinki  Declaration on human experimentation and Good Clinical Practices for Clinical Research in India. Each patient who presented with symptoms of schizophrenia was confirmed and assessed by psychiatrist at baseline and during follow-ups. As guided by the psychiatrist engaged in the study, patients who showed "inadequate response to at least two 3 rd generation antipsychotic drugs at the maximally tolerated dose within the recommended therapeutic range lasting 3 weeks" were considered as treatment resistant cases. Patients who had not taken antipsychotic treatment for the disease prior to enrolment were considered as "untreated cases." The patients were admitted in the inpatient department of the same institute for 2-3 months and in the case of acute exacerbation or as and when required. The patients who were on antipsychotic drugs were allowed to continue the same along with homoeopathic medicines, and the dose of the same was monitored by the psychiatrist; however, others were prescribed homoeopathic medicines only as guided by the psychiatrist. Ethical clearance was obtained from the Ethical Committee, and the protocol was approved by the Scientific Advisory Committee. A prior training was given to the investigators regarding the study protocol. The study was funded by CCRH, Ministry of AYUSH, Government of India. All the patients were assessed for severity of illness using the 18 points brief psychiatric rating scale (BPRS) and Clinical Global Impression (CGI) scale. The assessment was done at baseline, 3 rd , 6 th , 9 th and 12 th month to validate the changes in the BPRS score in comparison to baseline review. Patients of both sexes presenting the symptoms of schizophrenia (as per the definition of International Statistical Classification of Diseases-10) were screened as per the inclusion/exclusion criteria mentioned below. The diagnosed patients' gave written informed consent. Cases with life-threatening medical condition. After enrollment, an indepth interview with the patients and their guardians was conducted according to Homoeopathic principles and was recorded in a case recording proforma. After complete case taking, repertorization was done on the basis of the totality of symptoms. Final prescription was based on the individualization of the patient, after consulting Materia Medica. The initial prescription of the selected medicine was made in 30CH potency, in a single dose (4 pills of globule No. 30) followed by placebo (4 pills of unmedicated globules No. 30). The follow-up was done monthly for 12 months through scheduled visits, to monitor the condition of the patient by using the BPRS, to record the changes in behavior and relapse of the symptoms, if any. Compliance of instructions and adherence to the prescribed therapeutic schedule was affirmed. However, patients were free to report at any time during adverse events or emergency situations. On each of these visits, total clinical assessment was done by both the investigator and the psychiatrist. In case of any event of emergency condition, i.e., worsening of complaints, patients were referred for other medical care. Response of the prescribed medicine was assessed, and further treatment was done as per the guidelines prescribed by Dr. Hahnemann  and Dr. Kent. Medicine was repeated depending on the frequency, intensity, and duration of the symptoms, till perceptible change appeared (improvement in signs or symptom, appearance of new symptom, worsening of sign and symptom. Appearance of any change was immediately followed by placebo/change in potency/change in remedy, depending upon response. In cases where no signs of improvement noticed, potency was raised. Even if no change was observed, re-analysis of the case was done. In case of acute exacerbation of symptoms or appearance of any other acute disease condition, the medicine selected was either a continuation of the preselected medicine, or one of the better-indicated medicines case was retaken to make further prescription. This medicine was prescribed repeatedly as per the intensity of the acute exacerbation. If in case the condition of the patient deteriorated, it was referred for conventional or other treatment. BPRS, the most widely used rating scale in psychiatry compring of 18 items rated 0 (not present) to 7 (extremely severe), was used to verify the status at baseline and each follow-up visits. The outcome was evaluated on the basis of change in the BPRS Scores. Change was calculated using formula: [Baseline score-score at end]/base line score ×100. Changes were graded as follows: Marked improvement (75 to <100%), moderate improvement (50 to <75%), mild improvement (25 to <50%), not significant (<25%), not improved (no change in score), and worse (increase in score). CGI scale was used to measure the intensity of disease (range from 1 to 7). 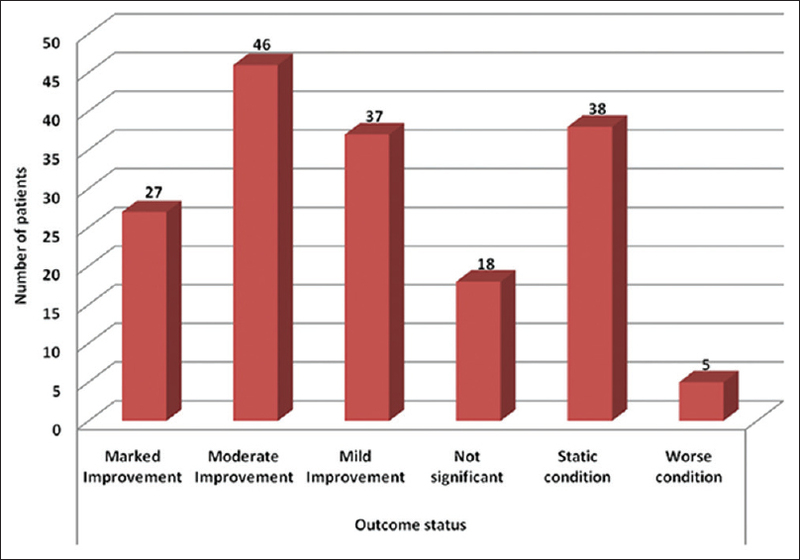 The "severity of illness" and "global improvement" were assessed at baseline and at each follow-up visits. Statistical analysis was done using SPSS software Version 20.0. Repeated measures ANOVA test was used to compare the changes in total BPRS scores at various time points during the study. Non-parametric tests were used for ordinal data. Friedman & McNemar test was used for data analysis of each symptom and a P < 0.05 was considered as significant. The analysis of the outcomes as compared to the baseline values was done as per "intention to treat (ITT)" with last observation carried forward for 66 cases with irregular follow-ups. Out of 427 screened, a total of 188 patients who fulfilled inclusion and exclusion criteria were enrolled. Of these 17 cases did not complete the baseline information. 105 cases completed the follow-up of 12 months as per the protocol whereas 66 cases visited for varied time period during 12 months. The detail of patients enrolled is depicted in [Figure 1]. Among the enrolled cases, schizophrenia was found to be prominent in males (63.2%, n = 108), single (60.8%, n = 104), and age group 20 and 40 years, (76.6%, n = 131), with positive family history (61.4%, n = 105). It was found that most of the patients were educated up to 10 th class (43.9%, n = 75), unemployed (36.3%, n = 62), businessman (26.9%, n = 46), and laborers (22.8%, n = 39). The mean duration of suffering was 10.6 ± 7.3 years. 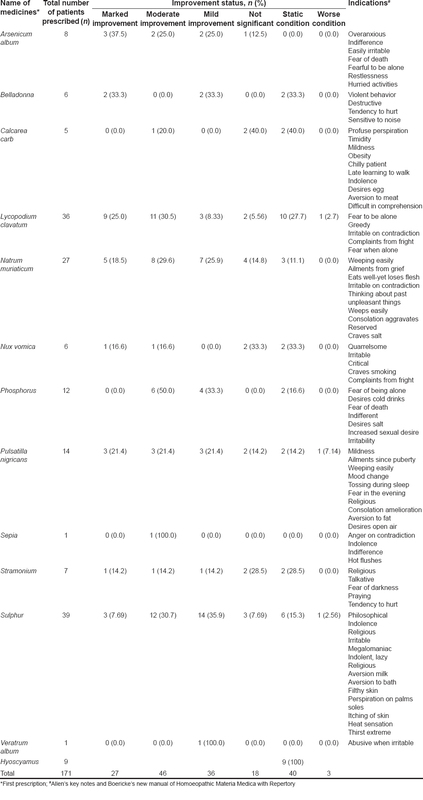 61.4% (n = 105) patients were having family history of schizophrenia. At the baseline, there were 16.4% (n = 28) patients presented with acute exacerbation whereas 83.6% (n = 143) came in their chronic states. There were 85.6% (n = 147) patients on conventional antipsychotic treatment, 5 were on homoeopathic treatment, 19 had taken no treatment prior enrollment, 19.0% (n = 28) were resistant to them. The baseline information is given in [Table 1]. 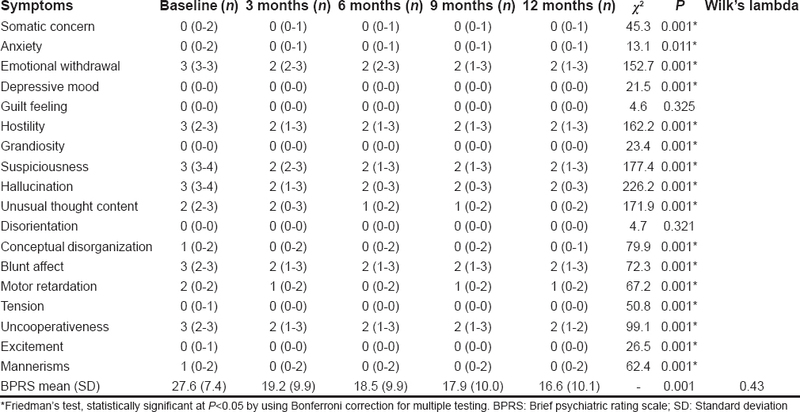 Friedman's tests by using Bonferroni correction for multiple testing showed statistically significant result (P < 0.05) in individual symptom of BPRS at the end of the treatment [Table 2]. 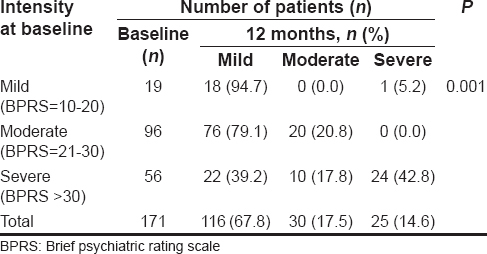 Assessment of individual symptom and overall change in BPRS at the end of the treatment using McNemar test also showed significant result [Table 3]. Nineteen patients had schizophrenia of mild intensity, 96 moderate, and 56 of severe intensity according to BPRS scores at baseline. However, after treatment, 67.8% (n = 116) patients shifted to mild intensity, 17.5% (n = 30) to moderate, and only 14.62% (n = 25) were of severe intensity. 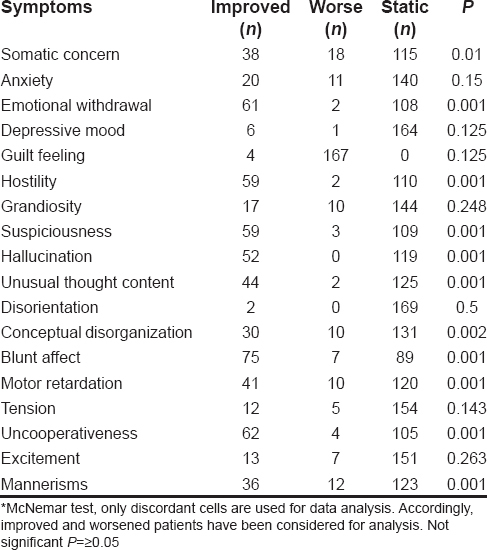 Five patients became non-schizophrenic, i.e., BPRS score fell below 10, which is depicted in [Table 4]. As guided by the psychiatrist engaged in the study out of 147 patients, who were taking antipsychotic treatment prior to enrollment, 79 were prescribed antipsychotic drugs along with homoeopathic medicine and 68 were prescribed homoeopathic medicines only. Patients who were on antipsychotic drugs along with homoeopathic medicines showed marked (19.0%, n = 15) to moderate (27.8%, n = 22) improvement while who were on homoeopathic medicines alone, showed moderate (26.1%, n = 24) to marked (13.0%, n = 12) improvement. The outcome status is reflected in [Figure 2]. Out of 28 patients who were treatment resistant, 4 improved markedly, 12 moderately, 8 mildly, 3 not significant, and 1 patient was static. Out of 19 untreated cases, 3 showed marked, 5 showed moderate, 4 showed mild, and 2 showed non-significant improvement whereas 5 were static. Out of 105 patients who had completed 12 months follow-up as per the protocol, 90 patients required change in prescription. Thirteen remedies were most commonly indicated and found useful in treating schizophrenic patients. Of these Sulphur (22.8%, n = 39), Lycopodium clavatum (21.1%, n = 36), Natrum muriaticum (15.8%, n = 27), Pulsatilla nigricans (8.2%, n = 14), and Phosphorus (7.0%, n = 12) were chiefly indicated and showed varying degree of improvement. These five medicines were administered to 128 patients (74.8%) patients out of 171 enrolled. Medicines and their indications in the study patients are depicted in [Table 5]. Out of 74.8% (n = 128) patients who suffered continually throughout the year at baseline, only 38.0% (n = 29) were of same status after treatment. There were overall 29 relapses in all the patients with median 7 (7-7) before treatment and after treatment the overall relapses reduced to 17, 2 (1-7). 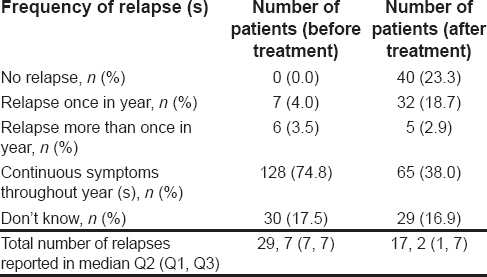 23.3% (n = 40) patients had no relapse in 1 year follow-up [Table 6]. Five cases were required to admit during relapse (acute exacerbations). Medicines found useful during relapse were Arsenicum album, Belladonna, Hyoscyamus niger, Lycopodium clavatum, Nux vomica, Phosphorus, and Stramonium. The antipsychotic drugs viz., chlorpromazine, clozapine, haloperidol, lorazepam, olanzapine, quetiapine fumarate, risperidone, sertraline, and valporate chrono advised by the psychiatrist were prescribed singly or in varied combinations in few patients. The dosage of these was tapered in nine patients and withdrawn in 17 patients as per discretion of treating psychiatrist. The details of these are depicted in [Table 7]. Though Homoeopathy has been found useful for the patients of schizophrenia over the years, however, scientific evidence is lacking. In the earlier study of CCRH,  scientific tools were missing; hence, the present study outcome assessment was based on internationally accepted scales for schizophrenic patients. During the trial, it was observed that maximum patients were in the age group of 20-40 years which goes with the prevalence report of the World Health Report 2001. It is also consistent with the study by Nyer et al.,  wherein they have observed schizophrenia prominent among singles whereas it is not consistent with the study of Rudaleviciene et al. where schizophrenia was observed in higher than secondary education. Most of the patients of schizophrenia often report relapse, and it occurs soon after the withdrawal of antipsychotic drugs. A study on schizophrenia  demonstrated that in 34.7% patient's symptoms relapsed within 1 year. Another study by Millier et al. demonstrated that symptoms relapsed in around 23.7% patients who were given monotherapy and 33.3% patients who were on polypharmacy within 1 year. However, in the present study, where patients were treated with homoeopathic medicines, relapse was found in 21.6% patients. The homoeopathic medicines such as Lycopodium clavatum, Pulsatilla nigricans, and Sulphur were found to be most useful for schizophrenic patients in the present study which were also observed in the earlier studies on behavioral disorders. , The medicines found effective during relapse were Arsenicum album, Belladonna, Hyoscyamus niger, Lycopodium clavatum, Nux vomica, Phosphorus, and Stramonium. This laid the foundation for further exploration of these specific medicines in treating the patients of schizophrenia. The reduction of dosage and withdrawal of antipsychotic drugs was observed in 9 and in 17 patients, respectively, over a period of 1 year which was encouraging. During the study, none of the patients showed any side effect which is generally observed in antipsychotic drugs. This further justifies that it can be a good substitute of the antipsychotic drugs in the treatment of patients of schizophrenia as it does not cause any side effect , or drug resistance, which is usually observed in conventional treatment. The present study had some limitations too. It was a non-comparative, open trial study; hence stands weaker than controlled trials on the strength of evidence. Further untreated cases of schizophrenia were less in number due to which statistical evaluation on untreated cases could not be ascertained. Hence, further explorations with placebo-controlled or conventional treatment controlled randomized design exclusively on untreated cases can be conducted to determine the efficacy of homoeopathic medicines in schizophrenia. The study reflects the positive role of homoeopathic medicines in the management of patients suffering from schizophrenia as measured by BPRS. Randomized controlled trials are suggested to assess the efficacy of homoeopathic medicine in schizophrenia . The authors are thankful to the Director General of CCRH, Dr. Raj K Manchanda, former Director Dr. Alok Kumar for providing technical co-operation and administrative support from time to time for conducting the study. We acknowledge Dr. Suresh Ninan, Consultant Psychiatrist for contribution in actively participating in guiding the prescription of antipsychotic drugs. Contributions of Dr. V. Roja, RO (H) and Mrs. Maya Padmanabhan for helping in the statistical analysis of the study and Mrs. Reshmi, CRI (H), Kottayam in helping in pre-analysis are acknowledged. We acknowledge the co-operation of the Officer-In charge of the Institute and the patients enrolled in the study for their co-operation that provided an opportunity to probe the scope of homoeopathic medicines. Central Council for Research in Homoeopathy, 61-65, Institutional Area, Janakpuri, New Delhi 110058, India. WHO. ICD-10, International Statistical Classification of Diseases and Health Related Problems. 10 th Revised Edition. Vol. 1. Geneva. WHO; 2004:306-8.
WHO. Department of Health Statistics and Information Systems. Global Health Estimates Technical Paper WHO/HIS/HSI/GHE/2013.4. Geneva. WHO; Nov. 2013: 1-90. Available from: http://www.who.int/healthinfo/statistics/GlobalDALYmethods_2000_2011.pdf?ua=1. [Last accessed on 2015 Jan 13]. Bharathi G, Swaminathan N. India is failing the mentally ill as abuses continue. Lancet 2010;376:1633-4. Serious Mental Illness: Symptoms, Treatment and Causes of Relapse. Bipolar Disorder, Schizophrenia and Schizoaffective Disorder. Available from: http://wfmh.com/wp-content/uploads/2013/11/WFMH_GIAS_SMI_FactSheet.pdf. [Last accessed on 2013 Sep 12]. Timothy JR, David JC. Pharmacological approaches to the management of schizophrenia. MJA 2003;178:S57-61. Fisher P, Dantas F, Rampes H. The safety of homoeopathic products. J R Soc Med. 2002;95:474-6. Janardhan NK, Gopinathan S, Pramanik MS, Shaw R, Balachadran VA, Kurup TN, et al. Behavioral Disorders. Series I.: Clinical Research Studies; Clinical Research Studies; New Delhi; central council for research in Homoeopathy: 2008. p. 1-14. Balachandran VA. Homoeopathic management of schizophrenia - An analytical report. CCRH Quarterly Bulletin 1996;18:15-8. World Medical Association. World Medical Association Declaration of Helsinki: Ethical principles for medical research involving human subjects. J Postgrad Med 2002;48:206-8. Good Clinical Practices for Clinical Research in India. Available from: www.cdsco.nic.in/html/GCP1.html. [Last accessed on 2014 Jan 12]. Hahnemann S; Organon of the Medicine Art. Edited and annotated by Reilly WB, the sixth edition of Dr.Samuel Hahnemann′s work of genius based on translation by Steven Decker; first Indian edition; New Delhi. B. Jain Publisher (P) Ltd.; 2010. p. 218-29. Kent JT. Lectures on Homoeopathic Philosophy. Thorsons Publisher Ltd.; 1979. p. 235-41. Nyer M, Kasckow J, Fellows I, Lawrence EC, Golshan S, Solorzano E, et al. The relationship of marital status and clinical characteristics in middle-aged and older patients with schizophrenia and depressive symptoms. Ann Clin Psychiatry 2010;22:172-9. Rudaleviciene P, Adomaitiene V, Stompe T, Narbekovas A, Meilius K, Raskauskiene N, et al. Delusions of persecution and poisoning in patients with schizophrenia: Sociocultural and religious background. Medicina (Kaunas) 2010;46:185-92. Emsley R, Chiliza B, Asmal L, Harvey BH. The nature of relapse in schizophrenia. BMC Psychiatry 2013;13:50. Gumley A, O′Grady M, McNay L, Reilly J, Power K, Norrie J. Early intervention for relapse in schizophrenia: Results of a 12-month randomized controlled trial of cognitive behavioural therapy. Psychol Med 2003;33:419-31. Millier A, Sarlon E, Azorin JM, Boyer L, Aballea S, Auquier P, et al. Relapse according to antipsychotic treatment in schizophrenic patients: A propensity-adjusted analysis. BMC Psychiatry 2011;11:24. 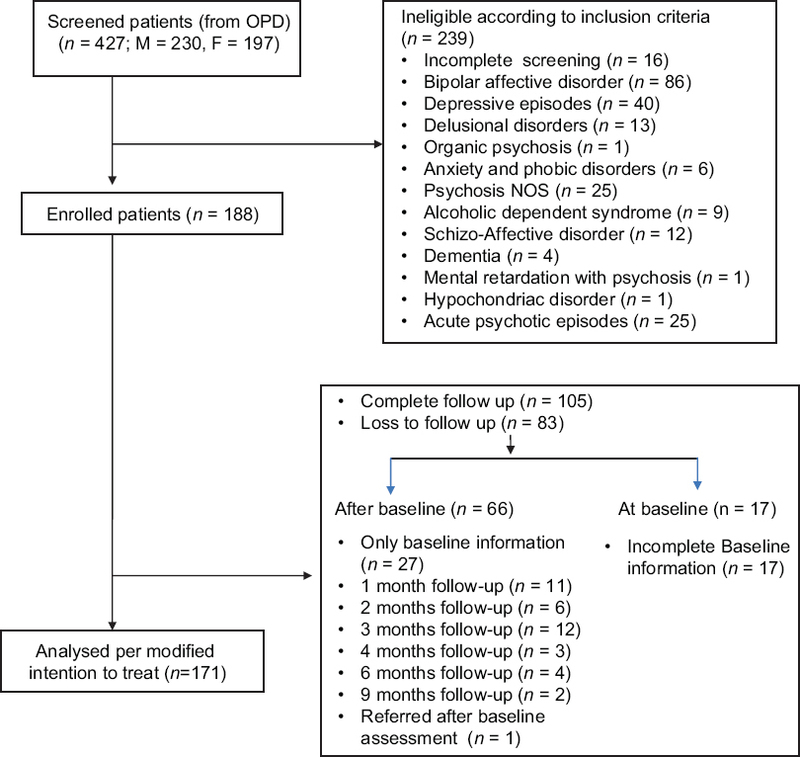 Kinon BJ, Liu-Seifert H, Adams DH, Citrome L. Differential rates of treatment discontinuation in clinical trials as a measure of treatment effectiveness for olanzapine and comparator atypical antipsychotics for schizophrenia. J Clin Psychopharmacol 2006;26:632-7. Dantas F, Rampes H. Do homoeopathic medicines provoke adverse effects? A systematic review. Br Homeopath J 2000;89 Suppl 1:S35-8.